Decorator 3 BDRM, 3 BA Home with Pool & Spa! Walk to Shopping, Restaurants & Theater! 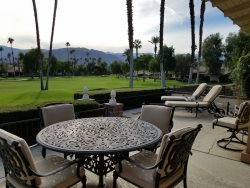 No question about it … you’re going to love this vacation home located in Lake La Quinta, a quiet, hidden, gated community just off Adams and HWY111, right in the middle of everything, but nestled in a quiet, little community. Guests can easily walk to Target and dozens of other surrounding stores, restaurants and the desert’s newest multi-plex, easy-chair movie theater. Location, Location, Location! It doesn’t get better than this! This 2,500 sq. ft. open floor plan home has been completely updated, professionally furnished and decorated. The great room offers gorgeous views of the lush landscaping, back patio and pool area. The great room is surrounded by windows, letting in sunshine no matter the time of day. The custom sectional sofa and occasional chair offer plenty of seating for family and friends to enjoy the mounted flat screen cable TV, a movie on the DVD player or just to enjoy a cozy winter fire. There is also a wet bar with seating tucked in the corner of the great room. The dining area has been set up to seat eight, but the table has an additional leaf and two more chairs to seat up to ten. Guests may enjoy using the kitchen bar for casual dining, morning coffee or visiting with the cook. There are four bar stools for seating. The kitchen is a cook’s dream. All the cooking and entertaining supplies you can imagine … and then some! All stainless appliances, double ovens, gas stove, granite counter tops and storage galore. The open kitchen design gives you a birds eye view of the living and dining area … so visit with guests or watch TV while cooking! The three bedrooms are perfectly separated. The master suite is located at the back of the house and if you walk out through sliding glass doors, you can step right into the hot tub with your chilled glass of wine and enjoy a perfect desert evening under the stars. The huge master “retreat” is furnished with a comfortable king bed and large flat screen cable TV. The luxurious on-suite has both a walk-in shower and an oversized soaking tub, duel vanities and walk-in closet. A “king” guest bedroom with private on-suite and a “queen” guest bedroom are located at the front and side of this vacation home. The queen guest bedroom shares its bathroom as a hallway guest powder room. A full indoor laundry room with sink has wonderful new front-load washer and dryer and a convenient utility sink. There is direct access from the garage into the home. The back patio and pool area have been beautifully furnished with dining for six, two chaise lounges and a seating area. The pool is saltwater and professionally maintained twice a week. There is also a sizable BBQ for your outdoor chef. This is truly a beautiful property and appointed more as a private home than a vacation rental property. The furnishings are quality, the maintenance meticulous, and the home is spotlessly clean! Guests will not want to go home! Definitely not your typical vacation rental.